I asked my sister if I could make it lavender because I have tons of Debbie Bliss baby cashmerino yarn in that color (an abandoned sweater project for Nora), but she said no. Boys can wear lavender, so I don't understand why. But anyway, now I'm making it brown. 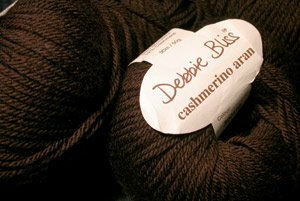 I have two balls of brown Debbie Bliss cashmerino aran (an abandoned Teddy Bear project—I don't finish many things), so I hope it will be enough. Maybe I can put lavender trim on it.